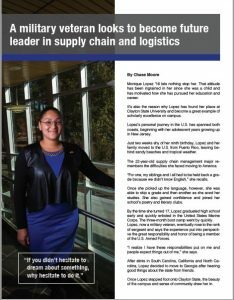 Clayton State University student Monique Lopez dreams of owning her own company one day in the supply chain management field. Becoming the recipient of the Marcia Taylor Family Foundation Annual Scholarship may help make that happen. The scholarship is given to any junior or senior majoring in supply chain management through the College of Business. A year after entering the university as a junior, Lopez was profiled in the university’s publication, The Laker Connection. The article includes a sidebar article about Bennett CEO Marcia Taylor’s role as a pioneer for women in supply chain management. View the article. Bennett CEO Marcia Taylor one of 11 people to receive 2017 Horatio Alger Award. WASHINGTON, D.C. (December 6, 2016) – Horatio Alger Association of Distinguished Americans, Inc., a nonprofit educational organization honoring the achievements of outstanding individuals and encouraging youth to pursue their dreams through higher education, today announced that Marcia G. Taylor, president and chief executive officer, Bennett International Group, LLC, has been selected for membership in the prestigious organization. Ms. Taylor joins 10 other esteemed business and civic leaders from across North America in receiving this honor in 2017. For the last 70 years, the Horatio Alger Award has been annually bestowed upon admirable leaders who have succeeded despite facing adversity, and who are committed to higher education and charitable efforts in their local communities. Ms. Taylor was born to working class parents in Southern Illinois. Her father passed away when she was 14 and that single event forced Ms. Taylor to grow up quickly, helping with household chores and caring for her younger brother. She married at a young age, but her marriage quickly became unhealthy, and she soon found herself raising three young children on her own. Determined to provide for her family, Ms. Taylor took a chance and accepted a job with a small trucking company in Georgia where she met her second husband. Together in 1974, the couple acquired George Bennett Motor Express, a company with 15 trucks, 30 trailers, two contracts and only $500 in the bank. With a keen focus on customer service, Ms. Taylor and her husband worked diligently to increase profits, making many personal sacrifices along the way. When Ms. Taylor’s husband died unexpectedly in 1981, she was left to run the company on her own. She made the conscious decision to press on and grow the business, becoming an admired female leader in a male-dominated industry. Today, Bennett International Group, LLC spans a network of more than 4,500 employees, agents, and owner/operators encompassing eight divisions providing services from basic transportation to rigging and cranes. Ms. Taylor believes deeply in giving back to the community, and has worked diligently to ensure that philanthropy plays an important role in the culture at Bennett. In 2012, her family established the Taylor Family Foundation, of which Ms. Taylor is the CEO. The foundation allocates a percentage of Bennett’s quarterly earnings to charities in the greater Atlanta area and across the country. In addition, she donates her time and talent to many local and national boards, including Children’s Healthcare of Atlanta Foundation – Henry County Branch, the National Museum of Wildlife Art, the Council of National Policy and United Community Bank. 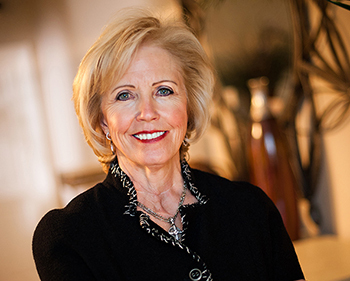 She is particularly passionate about issues affecting women’s health, and is the former chairman of the board at Piedmont Henry Hospital, to which she was the lead donor of the Marcia G. Taylor Women’s Center. Ms. Taylor has been honored with several prominent awards, including the 2014 “Influential Woman in Trucking Award” and the 2012 “NDTA National Transportation Award.” She was also selected as “Atlanta Woman of the Year” in 2008 and named the Boy Scouts of America’s “Golden Eagle Honoree” in 2015. Through its Members, Horatio Alger Association aims to educate young people about the limitless opportunities afforded to them by the free-enterprise system. To further this goal, the organization awards scholarships to outstanding high school students who are committed to pursuing higher education and giving back to their communities. Like Association Members, Horatio Alger Scholars have faced significant adversities, but have also displayed unmatched resilience in overcoming their challenges. Since the scholarship program was established in 1984, Horatio Alger Association has provided more than $125 million to students in need. Scholarships are privately funded solely through the generosity of Association Members, Life Partners and friends. Ms. Taylor and the Member Class of 2017 will be formally inducted into the Association on March 30-April 1, 2017, during the Association’s 70th Horatio Alger Award Induction Ceremonies in Washington, D.C. The annual three-day event honors the achievements of both Members and National Scholars, affording both groups the opportunity to meet and interact, exchanging stories of hardships and triumphs. For more information about Horatio Alger Association and its Member Class of 2017, please visit www.horatioalger.org and/or follow the organization on Facebook, Twitter and Instagram. Founded in 1947, the Horatio Alger Association of Distinguished Americans, Inc. is dedicated to the simple but powerful belief that hard work, honesty and determination can conquer all obstacles. The Association honors the achievements of outstanding leaders who have accomplished remarkable successes in spite of adversity by bestowing upon them the Horatio Alger Award and inducting them as lifetime Members. Horatio Alger Members support promising young people with the resources and confidence needed to overcome adversity in pursuit of their dreams through higher education. Through the generosity of its Members and friends, the Association awards more than $12 million annually in undergraduate and graduate need-based scholarships across the United States and Canada and provides college support and mentoring services to its Scholars. Since 1984, the Association has awarded more than $125 million in college scholarships to more than 25,000 deserving young people. For more information, please visit www.horatioalger.org. Many dream about getting the opportunity to go to college to further their education, but sadly, some won’t have that opportunity simply because they can’t afford it. Clayton State is doing what they can to make sure this doesn’t happen by holding the inaugural “Give 4 Dreams”event. Held Tuesday, March 1, for 24 hours the school ran an initiative raise funds to go to scholarships, conferences, emergency funds for students, and more. Noah and Katlyn Foulks attended the event on behalf of the Taylor Family Foundation. Noah Foulks said that attending the event on behalf of the foundation was an honor. Foulks also added how fortunate it is to have a local university that provides the course of study and a degree in transportation and supply chain management. The Taylor Family Foundation regularly donates funds for scholarships for students in the Supply Chain Management Program, and Bennett International Group’s Marcia Taylor is set to receive an honorary doctorate from the school in May 2016. 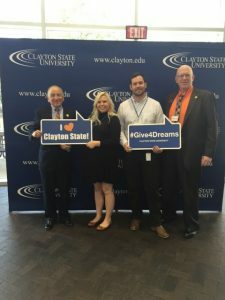 For more information about the “Give 4 Dreams event,” visit https://www.clayton.edu/give4dreams. What does Bennett International Group’s President and Chief Executive Officer Marcia Taylor and radio personality, television host, and producer Ryan Seacrest have in common? They are both among the select few approved to receive an honorary doctorate for their contributions in their respective industries by Georgia’s Board of Regents. While Seacrest will join the University of Georgia’s commencement in May to receive his honorary Doctor of Humane Letters degree, Taylor is set to receive her honor from Clayton State University during a commencement ceremony scheduled for May 7. 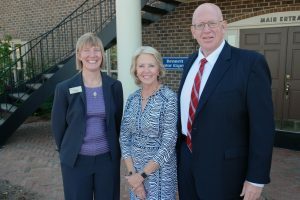 Taylor learned about the honor Oct. 21 when representatives from the university surprised her at the Taylor Family Foundation quarterly meeting that took place at Bennett International Group’s home office in McDonough. Kate Troelstra, vice president of university advancement with Clayton State, explained that the honorary doctorate is a very special designation bestowed on very few and requires the approval of the state’s Board of Regents of the University System of Georgia. The recommendation was initiated by Troelstra and Thomas Giffin, director of development at Clayton State, and was fully supported by Clayton State faculty. “It was a recommendation made by faculty based on the wonderful work she’s been doing, not only within her industry but at Clayton State University,” Troelstra said. Taylor was selected to receive the honorary doctorate because of her many accomplishments at Bennett International Group over the past 40 plus years, and her experience, industry knowledge, and professionalism that has made her a leader in the transportation and logistics industry. “She has been recognized by her peers in her profession, and there is a natural link between her and Clayton State University because of our Supply Chain Program, one of our fastest growing programs,” Troelstra said. The school also recognized that for the past several years Taylor has made significant scholarship gifts to the school for students in the Supply Chain Program, and those scholarships have been life-changing. Troelstra said there are students who would not have had the opportunity to finish their education if it weren’t for Taylor’s gifts. In addition, Taylor was a featured speaker for the Jim Wood Speaker Series last spring where she shared her experiences in the business world. “It was a wonderful thing to see and to be a part of,” Troelstra said, talking about Taylor’s address to the students. Troelstra said the combination of Taylor’s many accomplishments in the industry, her leadership, her service to the local community, and her connection with Clayton State University really made it an easy recommendation. “…and I think the faculty had no problem echoing that recommendation to the president,” Troelstra added. With a few colleagues and family members around, Troelstra and Giffin presented Taylor with the news and Taylor said she was overwhelmed. On several occasions people have asked me, ‘what do you give a person that can get anything for themselves?’ Well, this is one of these things. My mom spent her early years raising three children and working two jobs. College was not an option. With only a high school diploma and a passion to survive, she learned to be a wonderful business leader, entrepreneur, negotiator, mentor, and community leader… Clayton State University, which is a part of the University of Georgia system, has recognized that Marcia Taylor’s business knowledge far exceeds her current resume and voted her as one of very few to receive this honor. She has always been a huge supporter of the importance of education and has paid for several children and adults to go to school. And NOW she is getting paid back tenfold. Her life lessons and sacrifices have now been recognized. Congratulations to Marcia G. Taylor! Your Bennett family is very proud of you! 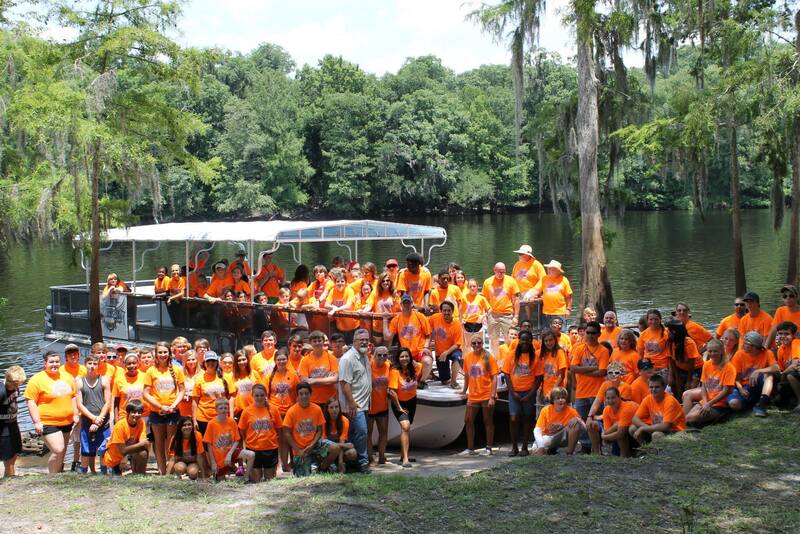 On July 13, approximately 65 children of Bennett employees, boarded a bus at the Bennett home office in McDonough, Georgia – their destination – Old Town, Florida where Camp Anderson was transformed into Camp Bennett for the week. Also from Bennett were seven employees, who left the office behind and made the trek to Florida to participate as counselors to lead the campers in their daily activities. Marcia Taylor, president and chief executive office at Bennett, also joined the campers for a day of recreation and worship. For many unsuspecting campers, it was their first experience at the camp. For others, well…they knew exactly what they were in store for, and according to their “end of camp testimony cards, they didn’t leave disappointed. 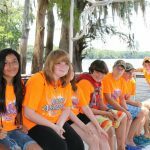 During the week campers participated in a number of water sports and activities such as boat rides on the “Lady Taylor,” and plenty of recreation and games. But perhaps the most significant and impactful part of the week was each day when the campers woke up and attended chapel and ended each day back at the worship center listening to the inspiring messages as Pastor Kevin taught the campers the Word of God. And based on the camp’s history, it’s probably no surprise that many lives were changed during that week of Camp Bennett. By the end of the week, there were a total of 62 young people who gave their lives to Christ, 22 re-dedicated their lives to Christ, and 45 were baptized in the river on Friday morning! 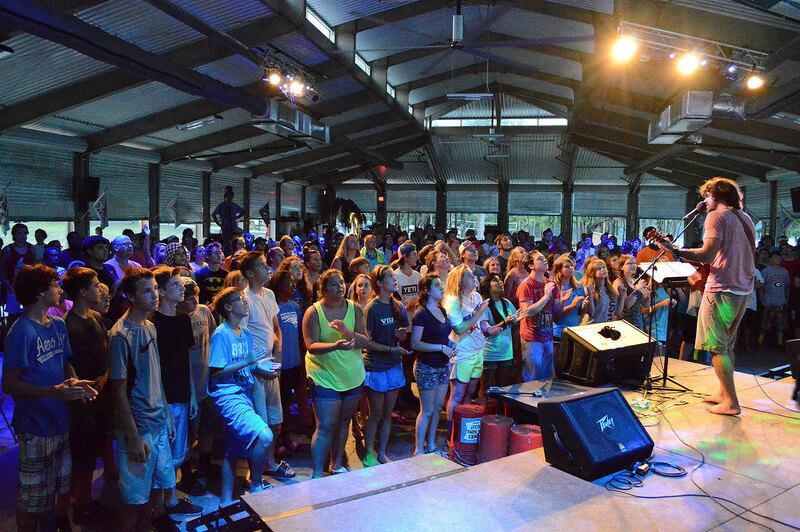 For many campers and counselors alike, it was a week of awakening. For others it was a week of renewal. And as the campers made their way home to Georgia, each one continues to wear the armor of God, prepared with His Word, and ready to share the love of Christ and their testimony so they may bring others to Him. Camp Bennett is an outreach made possible by the Taylor Family Foundation. 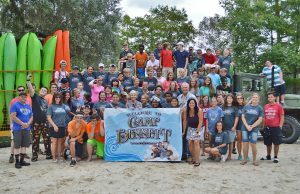 With the support of the foundation, children of Bennett employees, drivers and agents have the opportunity to attend and experience this unique week of camp. The Taylor Family Foundation contributes to many outreaches in the Henry County community and beyond. For more information about the Taylor Family Foundation, visit www.thetaylorfoundation.org. Bennett International Group’s Chief Executive Officer, Marcia Taylor, was featured in an article in the AJC for the Taylor Family Foundation’s contributions to Clayton State University. We are excited about all the money, clothes, and canned goods collected by Bennett agents, owner operators, and employees for this 2014 holiday season. This year our employees contributed from their paychecks $7,136.14, our drivers donated to our annual Truckin’ for Tots program $13,140.00 and the executives over the various business units matched the drivers adding another $15,000, the Taylor Family Foundation donated $173,800.00 for a Grand Total of $209,076.14. Thank you for having a servant’s heart for the sick, poor, and helpless. With your help, the Bennett Group of companies raised and distributed money out to several needy women, children and families in the communities we serve throughout the world. We are proud to be a Faith based company that has a heart for others. We believe that God has blessed us, and we want to pass along those blessings. Without YOU we could not make any of this possible. On behalf of the Taylor Family and Bennett we would like to say “Thank You” for all your love and support. We wish you a Merry Christmas and a Happy Safe New Year. On July 14, 2014 more than 50 kids loaded on a bus and headed for Old Town, Florida for a week of camp at Camp Anderson. 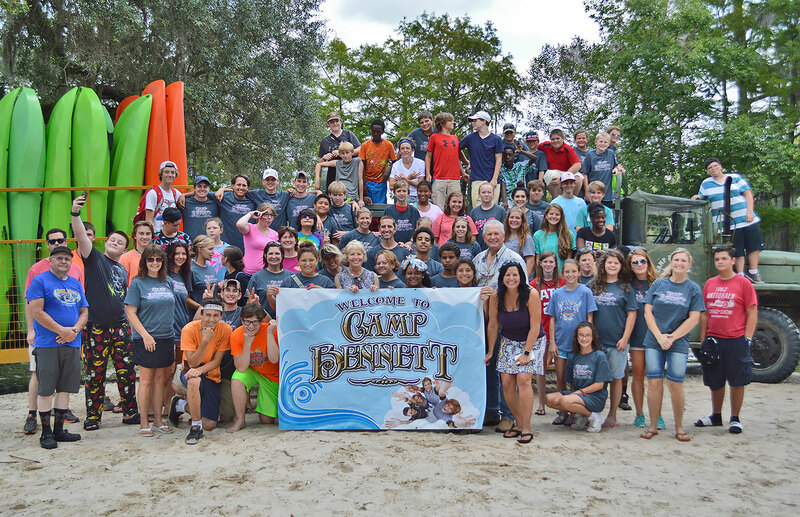 Many of the campers, ages 12 to 18, were children of employees that work at Bennett International Group, located in McDonough, Georgia. For these campers, it wasn’t just any camp – It was Camp Bennett. The children attended the camp through donations made by the Taylor Family Foundation, a private, family foundation established in 2012 by Mike and Marcia Taylor that supports and provides grants toward family values, senior citizen care, and community initiatives. During the fun-filled week, campers participated in a variety of activities including water sports, paintball, archery, tug of war, and more. Worship services were also held each day in the mornings and in the evenings. William Bloodworth, a staff member at Camp Anderson who is the husband of Cindy Bloodworth, a Bennett employee, said that along with the fun and fellowship, the camp’s staff and volunteers saw many young campers make life-changing decisions the week of Camp Bennett, more than any other week of the year. 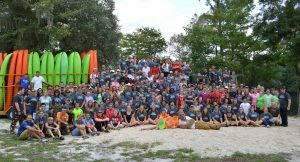 Overall, 26 campers publicly gave their life to Christ, 31 were baptized, and there were many who rededicated their life to Christ. Out of that total number, 13 campers from Bennett gave their life to Christ, and 11 were baptized. New this year was The Lady Taylor, a pontoon boat the camp can now use to navigate the waters of the Suwannee River to transport campers to other areas for swimming, water sports, and other recreational activities. 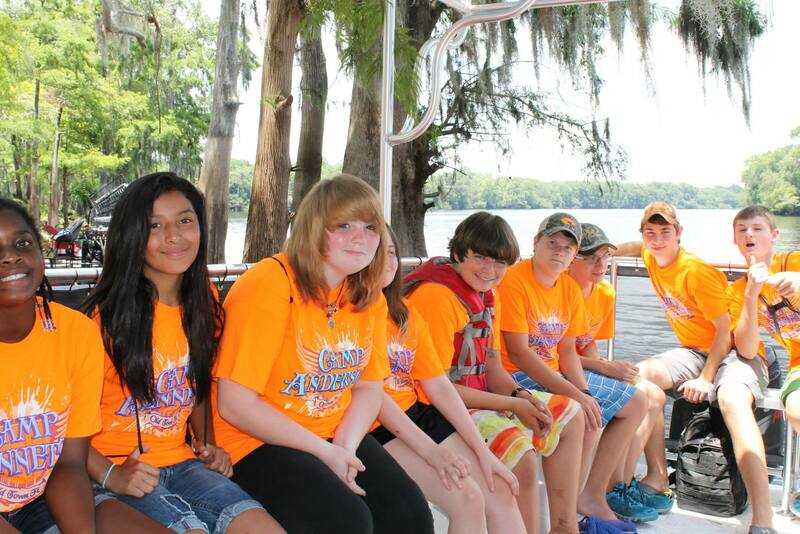 The boat was purchased for Camp Anderson with donations made and then matched by the Taylor Family Foundation. During the week of camp, Bennett campers and volunteers christened the vessel and took part in its maiden voyage up the river. Bloodworth said having the boat is a game changer for the camp. 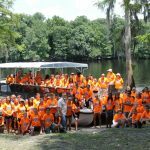 “The addition of The Lady Taylor has allowed us to expand the camp way beyond our 56 acres,” he said, adding that the boat has opened a whole new dimension to the camp so campers can really engage in the beauty of the Suwannee River and the nearby springs. Bloodworth said the Bennett (Bennett International Group) family and the Taylor Family Foundation has supported this Christian camp from the very beginning, and their involvement and investment has encouraged others to get involved as well. This was the second year for the company to hold the children’s camp at Camp Anderson. Lynette Mathis, a Taylor Family Foundation board member, said it was an incredible week to spend with some of our employee’s kids. “We know our employees but we don’t really know their kids, and so it gave us a chance to spend time with them, get to know them, and just love on them and show them how much we care about them,” she said. The first year they all went as campers, but for the second year, a few went back to camp as leaders in charge of a cabin of campers. “That was really cool seeing them (the leaders) grow and mature from one year to the next,” Mathis said, adding that it’s just fun to go and interact with kids and see them grow as young adults and have fun while doing it. Plans are in the works to hold Camp Bennett for a third consecutive year in July 2015. In June 2013, the Taylor Family Foundation made a donation to Children’s Healthcare of Atlanta in support of its mission to support children and provide quality healthcare. 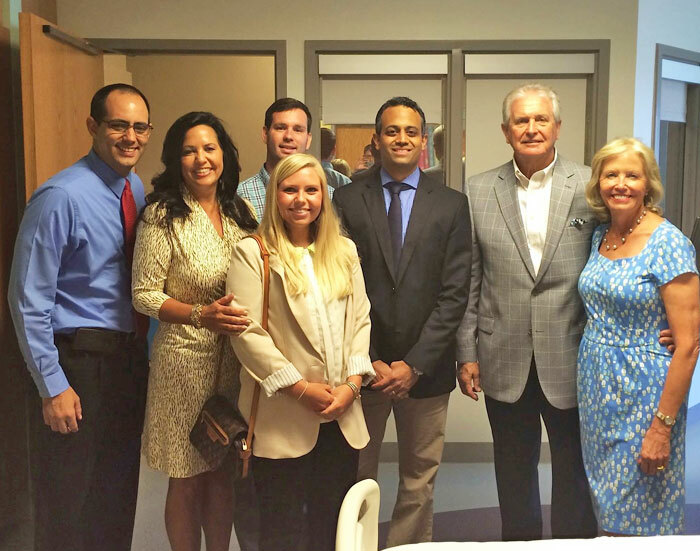 In May 2014, board members of the Taylor Family Foundation, including Marcia Taylor, president, and Lynette Mathis, Taylor’s daughter and board member, toured the children’s health care facility located on Clifton Road to see firsthand the impact the foundation’s donation has made at the hospital, its staff, its patients, and the community. 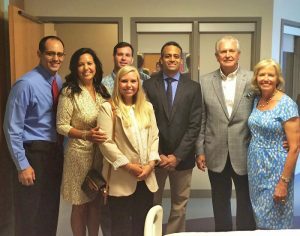 Kiran Hebbar, M.D., Pediatric Critical Care Medicine, led the group on the tour of the facility. During the tour Taylor and the others were shown the Pediatric Intensive Care and Simulation Room, a regular hospital room equipped with special teaching tools where health care workers train and practice to update and perfect their skills. Kiran Hebbar, M.D. 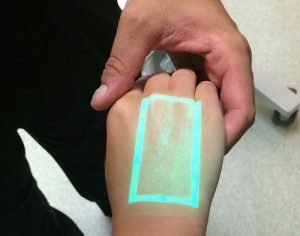 demonstrates the Vein Viewer Vision to members of the Taylor Family Foundation during a tour of the CHOA facility. 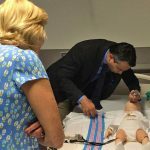 A crucial element included in the simulation room is a mechanical (simulator) infant that, when programmed, can mimic symptoms of a number of medical conditions and emergency situations. 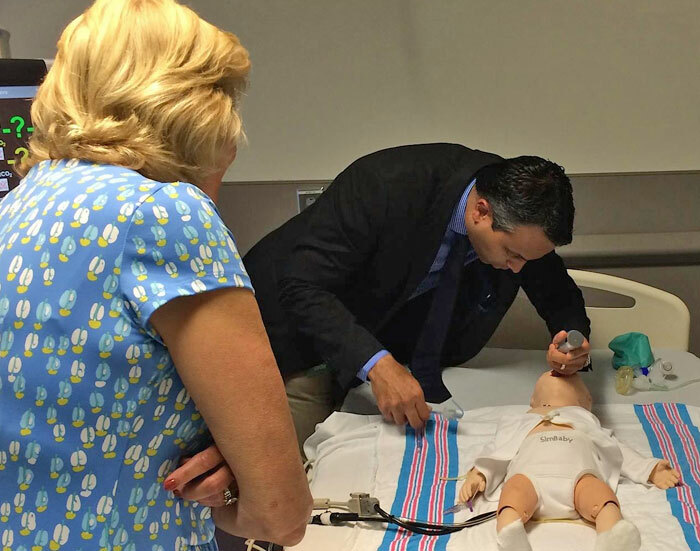 Once the infant is programmed for a specific medical condition, medical personnel can practice on the infant as if it were a real life situation. Near the simulation room there is an area where doctors and health care workers can control the infant and observe how the medical personnel react as they practice their skills, something that Hebbar said was so very valuable to the hospital when it comes to patient care. Eventually, CHOA would like to take the simulation room on the road by way of a mobile simulation room to provide training at other facilities in and around the metro Atlanta area. In addition to the simulation room, a portion of the donation went to purchase what’s called Vein Viewer Vision for the CHOA satellite facility located in Henry County on Hudson Bridge Road. The Vein Viewer Vision, a patch that is placed over one’s hand, forearm, or other area, uses technology that allows clinicians to visualize the location of veins using infrared light that highlight the veins underneath the skin. This helps the medical staff avoid multiple “sticks” when accessing a vein for procedures such as drawing blood or starting an I.V. ; and fewer sticks result in less pain for younger patients giving them better overall experience. Kiran Hebbar, M.D. demonstrates the mechanical (simulator) infant for Marcia Taylor and Taylor Family Foundation members as they tour the facility. Children’s Healthcare of Atlanta is a not-for-profit organization that relies on the generous financial donations and volunteer support of the community. Equipment like the Pediatric Intensive Care and Simulation Room and the Vein Viewer Vision aren’t included in the hospital’s operating budget, and therefore, is purchased only from additional donations made outside of the operating budget. At one time or another a few of Taylor’s own grandchildren have been patients at CHOA for medical procedures, so the family understands how important it is to have the best medical care with well-trained doctors and nurses. The donation to CHOA hits close to home and is part of the overall goal of the Taylor Family Foundation. For more information about the Taylor Family Foundation, visit https://www.thetaylorfoundation.org/.